Buy a new home or upgrade your existing one? It’s an age-old question among homeowners; one that’s influenced by the economy and the housing market. Lately, homeowners have opted to upgrade. In 2011, more than $115 billion was spent on home upgrades nationwide. Unfortunately, financing home construction is not as easy as it was 5 years ago. Few banks grant construction loans anymore and home equity lines of credit offer just limited-size credit lines — especially for a purchase. You can pay cash for your improvements, or you can seek a 203k loan via the FHA. 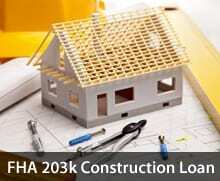 The FHA 203k program is an all-in-one mortgage program for home construction projects. It combines the mortgaged amount with your estimated home repair costs, and bundles them into one. FHA 203k loans make it possible to make home repairs after getting a mortgage. Typical mortgages required repairs to be made prior to getting financed. FHA 203k loans are especially useful for people buying foreclosed, abandoned, or otherwise run-down homes. There’s no need to finance repairs with cash. The 203k loan provides all the cash that’s needed. Click here for today's mortgage rates (Apr 26th, 2019). As with all loan programs — via the FHA or otherwise — there are eligibility standards for the 203k; the first and foremost of which is that 203k loans may not exceed local FHA loan limits. In some areas, such as Loudoun County, Virginia; or Orange County, California, this limit is $729,750. In other areas, it’s much smaller. Homes must be owner-occupied. No investment properties allowed. Homes must by 1-4 units, and must be at least one year old. No new construction. Construction and renovation must comply with zoning and building codes. If living units will be added to the existing property, they must be attached to the original structure. Furthermore, if you plan to demolish a structures as part of your 203k loan, you must ensure that the home’s existing foundation remains and that the home will be rebuilt on said existing foundation. If you’re considering buying a “fixer-upper” or making improvements to your existing home, an FHA 203k loan may meet your needs. Not all banks offer them, however. You may need to shop around. Or, get started with a rate quote. Know a Hannah, Austin, Alexis, Logan or Taylor? According to new data, they might just become homebuyers this year. So much for Southern hospitality. When it comes to annoying neighbors, the Lone Star State apparently has a lot of them. According to a new survey, Dallas, Austin and Houston are all in the top 10 for most annoying neighbors in the nation.